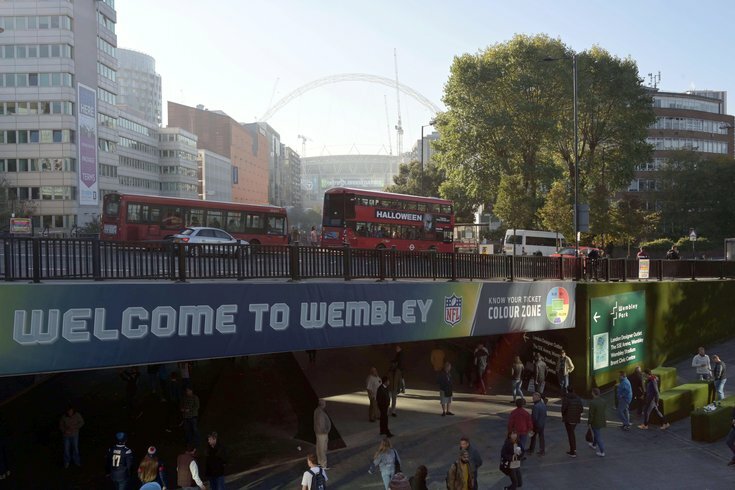 General overall view as fans arrive to an NFL International Series game at Wembley Stadium. Four members of the Jacksonville Jaguars were arrested early Saturday morning in London in advance of Sunday game against the Philadelphia Eagles, according to multiple reports. ESPN's Adam Schefter tweeted Saturday night that the players were detained by authorities over the restitution of a bill. The four players were identified by NFL Network as Barry Church, Ronnie Harrison, D.J. Hayden and Jarrod Wilson. “We are aware that four of our players were detained over restitution of a bill," the Jaguars organization said in a statement, via ESPN. "The matter is being resolved and the players are with the team. Any discipline will be handled internally." A statement from London police indicated that there was an altercation involving the players. Mailbag: Should the Eagles be buyers or sellers at the trade deadline? "Police were called ... following reports of a fight. Officers attended and spoke with a group of males who had allegedly been attempting to leave the venue without paying a large bill," authorities said. "Four men aged in their twenties were subsequently arrested on suspicion of fraud by false representation and taken to a central London police station for questioning. They were all subsequently released with no further action." According the SUN UK, the incident occurred around 4 am Saturday after the players allegedly attempted to leave the London Reign Showclub without paying a tab "in the region of £50,000," or the equivalent of about $64,100, a source told the publication. The incident comes as the spiraling Jaguars prepare for a matchup with the struggling Eagles at Wembley Stadium. The game is viewed as a must-win for both teams to get their seasons back on track after unanticipated slow starts. Las Vegas bookmakers moved the line for the game to 3.5 in favor of Philadelphia, up from 3.